For 15 years Komrovsky was the chef for a catering company called “Erez’s Cooking Studio.” In 1989 he settled in San Francisco, where he discovered breads that were a lot more involved than those he’d dealt with while studying cooking. When Komrovsky returned to Israel five years later he came to a crossroad in his life. He was torn between life in the central Tel Aviv apartment where he was born, and the pastoral life of a settlement in Western Galilee. “I can get more excited by seeing things growing in the fields than by reading Anna Karenina, which is a book I really love,” notes Komrovsky, yet he ultimately chose to live in the city and open a business. Ten years ago he established “Lehem Erez” with Ilan Rom. He started with a bakery in Herzliya, and a year later he opened a restaurant next to the bakery. By the time he’d opened another three stores the bakery had become too small, so it was moved to Netanya. Today the chain has 22 stores; ten of them opened this year. And still, the chain sells over twenty types of bread (the most popular is the French country bread - sourdough bread made with whole flour), some 15 types of cakes (the carrot cake is the most popular), pastries, cookies, spreads, and wine. 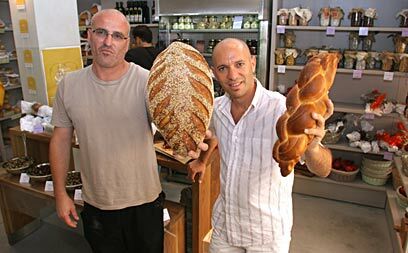 The importance of “Lehem Erez” should not be underestimated: The company brought the concept of gourmet bread to Israel. By setting such a high standard, “Lehem Erez” became a symbol of Tel Aviv’s refined tastes and pretensions. Komrovsky doesn’t eat breakfast at home. At 6:30 a.m. he goes to the gym and after burning some calories, he goes to the Ibn Gvirol store and eats toast, a croissant, or an apple pastry. Would you like a child? “I have seven nephews. They’re all boys. I don’t have children of my own. I’m already 44. I’m not sure that I'd have the strength today to run after a small baby. There was a period in my life when I wanted a child. Today I’ve begun to realize that perhaps my children are my breads. What I leave behind won’t be my genes, but my recipes. It’s funny that I’m not yet old, but I talk about my legacy. "I think that a person can live a happy life even if he isn’t a parent. There’s a fashion among gays to adopt the heterosexual model of being parents with children. I almost got into that, but in the end I didn’t. I’ve chosen another life, a life in which there’s a lot of freedom, a lot less obligation, although I’ve had a partner for twenty years. See all talkbacks "Famous baker: My breads are my children"